The Condado Plaza Hilton is a sophisticated hotel boasting a breathtaking oceanfront location in the vibrant Condado area, close to the Convention Center. From your private balcony, you can admire stunning views of the Atlantic Ocean and Condado Lagoon. The hotel offers the perfect combination of business and leisure facilities in a contemporary atmosphere, including tennis courts, protected beach and six dining options including the award-wining Pikayo restaurant. View of hotel from Ashford Avenue. Exterior view of the hotel. Aerial view of one of the hotel's pools. Aerial view of the exterior view of the hotel. Walkway between the two hotel towers. Ocean view from hotel room. Be inspired by panoramic views of the Atlantic Ocean and Condado Lagoon. Discover how warm tropical waters, vibrant culture, and fascinating history blend to create San Juan's charm and personality. Only saltwater pool in san juan. 672 guest room and suites. Most meeting rooms with natural light. The Condado Plaza Hilton offers enticing San Juan, Puerto Rico dining options to take you from your very first cup of fresh-brewed Starbucks Coffee to that late-night dining splurge after your night out in Condado. A good hotel gym can be the difference between a great trip and a guilt trip. Whether you need to get your heart pumping with the latest in cardio equipment, tone your beach body with free weights or just relax in the sauna or steam room, The Condado Plaza Hilton will help you work it off. Our fully equipped fitness facility is open 24 hours a day. 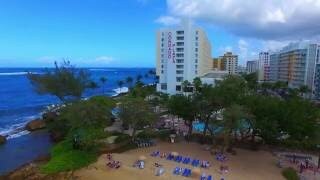 The Condado Plaza Hilton - Health and Wellbeing. View of pool and whirlpool.